Want to try out curling TODAY? 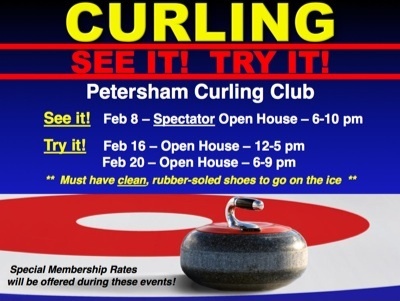 As we mentioned earlier, the Petersham Curling Club is having an Open House free to anyone TODAY, Sunday, February 16, from 12-5pm. At today’s Open House, you’ll learn how to deliver a stone, the role of sweeping and more. This will be a great opportunity to get on the ice and experience the sport yourself. All you need to bring is a pair of clean, rubber-soled shoes and your enthusiasm! This entry was posted in Events on February 16, 2014 by Dan York.